Advancements in technology and the financial industry paved the way for cryptocurrencies to be in the mainstream. Bitcoin – the leading cryptocurrency to date, has proved its profitability and flexible use. Experts found other ways on how you can benefit and make a profit out of Bitcoins. Many are still wondering how you can invest using Bitcoins. With the increasing number of businesses and institutions accepting Bitcoins as forms of official and formal payments, we will definitely see a spike in its value. If you are interested in stocks (well, even if you are not), this article will ignite your interest not just about the stock market, but also with cryptocurrency. Read on and learn more fantastic Bitcoin investments. Is this legal? For now, yes, although the law is evolving. You can also “mine” bitcoin, creating valid decryption keys by either using a service or using your own computer. When you find a new answer to the bitcoin puzzle, you own it. The keys portrayed in the media as metal are just magnetic ink. Each cryptocurrency coin is one answer to a puzzle set out by a currency blockchain. The value of those answers will rise, or fall, in an open market process, sometimes with dizzying speed. Bitcoin Cash, which forked from the main bitcoin blockchain in August, is now worth a fraction of what it was when the fork was initiated. There are also transaction costs in buying, or selling the cryptocurrency through an exchange. Getting the best price can take time. So can processing any transaction. Increasing the speed of processing transactions through the blockchain is the usual reason given for a cryptocurrency fork. There are other ways to play, of course, which are the subject of this gallery. Here are five low-risk stocks to buy to profit from the bitcoin craze. Even if you’re not interested in cryptocurrency, Nvidia Corporation (NASDAQ:NVDA) is a stock worth owning. The shares are up nearly 70% just in 2017, revenue is growing almost 40% during fiscal 2017 and the company is on track for over $8 billion in revenue this year, while taking 25% of that revenue to the net income line. Nvidia is also a very expensive stock, with a market cap of $111 billion. That’s almost 14 times this year’s estimated revenue, and a whopping 53 times earnings. High-performance graphics processors, first designed for video games, turn out to be great for the intense work of finding those decryption keys that represent crypto-coins. 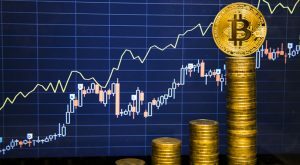 InvestorPlace contributor Joseph Hargett is concerned that the cryptocoin boom is already fully priced into the stock, but that is not the only reason to own it. The best reason to ride the Nvidia bull, is the cloud. Data centers are now going through their first upgrade cycle, to support Artificial Intelligence (AI) applications like voice interfaces, self-driving cars and the Internet of Things (IoT). Instant response is the key here. The low-end processor clouds like those of Amazon.com, Inc. (NASDAQ:AMZN) and Alphabet Inc (NASDAQ:GOOG, NASDAQ:GOOGL), which were built during this decade, just don’t have the processing power needed for the next decade’s growth markets. Nvidia graphics chips have it, and the company is benefiting, as seen in its most recent quarterly revenue breakdown. Revenue from data centers grew 175% between the second quarter of 2016 and the second quarter of 2017. They now represent the company’s fastest-growing segment. This should continue through the third quarter, to be reported Nov. 9, when $2.36 billion in revenue is expected, almost 20% more than last year’s $2 billion. That figure represented the company’s big breakout, taking the stock up nearly 70% over the succeeding three months. Clearly, the fastest-growing niches in the chip market are led by Nvidia. Intel Corporation (NASDAQ:INTC) is working hard to get into them, but Nvidia has the lead, and leads are difficult to overcome. Whether you’re looking at gaming, cloud, self-driving cars or IoT, you’re looking at NVDA chips. The stock is very pricey, but if you are looking three to five years ahead, as most true investors should, then this is one of the best growth bets in technology. History says you buy the leaders in technology and don’t worry much about the price — the artists formerly known as Google and Facebook Inc (NASDAQ:FB) were never considered cheap. For a company that doesn’t make much profit, Advanced Micro Devices, Inc. (NASDAQ:AMD) has been making a lot of money for investors lately. Over the last year, AMD shares have doubled in value, opening for trade on Oct. 9 at about $13.50 each. They cost less than $2 each early in 2016. AMD is very old by Silicon Valley standards, having been launched just one year after Intel, in 1969. For years, it sought to follow Intel with compatible PC chips. Its biggest moves during the last decade were to get into graphics, through a company called ATI, and to get out of manufacturing by spinning its chip foundry into a company formed by the government of Abu Dhabi. Earlier this decade, former CEO Rory Read led a major restructuring, and layoffs, focusing on a new chip design now called Ryzen and Radeon graphics chips. His chief operating officer, Lisa Su, took over in 2014 and is now given credit for the company’s rise. AMD is, as it has always been, a value chip maker. Its Ryzen chips compete with Intel based on value, delivering similar performance for less money. Its Radeon graphics processors also compete with NVDA based on value, delivering similar performance for less money. This is just what clouds are looking for. The decision by Alibaba Group Holding Ltd (NYSE:BABA) to use AMD chips in its clouds a year ago proved a turning point for the company. A month later, Advanced Micro announced a deal for its Radeon graphics chips with Alphabet. Since then, the company has signed an agreement with Microsoft Corporation (NASDAQ:MSFT) to use features of its next-generation “Naples” processor in its next cloud implementation, dubbed Project Olympus. The last two agreements illustrate a key risk factor for Advanced Micro Devices. To grow as cloud companies, both Google and Microsoft are getting heavily involved in chip design. Design is now AMD’s entire business, manufacturing having been spun-out. Will the clouds still need the company five years from now? For now, Advanced Micro Devices shares are riding the waves of cryptocurrency, cloud and gaming, but some are rightfully worried that the stock may be getting ahead of itself. I share that concern and I have suggested the company needs to be sold, as it lacks the capital base to compete effectively in the long-term. AMD next reports results Oct. 24, and analysts are expecting a profit of 8 cents per share, while whispering it might be a little higher. The expected revenue of $1.5 billion would be 15% more than its revenue for the same quarter a year ago. Advanced Micro Devieces is a tortoise whose stock acts like a hare because numbers are easier to grow fast when you’re small. But hares are also vulnerable in traffic. Barry Silbert has been behind many cryptocurrency trends over the last few years. He was previously best known for Second Market — a way to trade stock in private companies, acquired by NASDAQ Inc (NASDAQ:NDAQ) in 2015. His Digital Currency Group (DCG) was originally a unit of Second Market, combining a cryptocurrency trading firm called Genesis Global Trading with an asset management firm, Grayscale Investments. The Bitcoin Investment Trust (OTCMKTS:GBTC) is Silbert’s effort to bring digital currency investment to small investors. It is currently traded through what used to be called the “pink sheets,” its effort to get a listing through the NYSEARCA platform having failed in September. Some investment professionals call GBTC a joke, but it has won the race to become the first publicly traded bitcoin fund, having been launched as a private investment fund in 2013. When the fund was launched, bitcoin cost $100. It was trading Oct. 9 at over $4,500. GBTC began trade in 2015 at a price under $32 per share. On Oct. 9, it was trading at over $700 per share, a market cap of roughly $1.2 billion. Income has exploded with the rising value of bitcoin. The value of GBTC is 85% higher than the value of the bitcoin it holds. There are reasons for this. For one, you can buy GBTC in a tax-advantaged account like my retirement account. It’s publicly traded, meaning you can get out, and its coins are being hosted securely. Why, then, isn’t GBTC traded on a regular exchange? Why did the Securities and Exchange Commission (SEC) say no to that? Like many bitcoin entrepreneurs, Silbert has what the SEC considers a sketchy history. He has been accused by self-styled bitcoin Investing Ombudsman Charles Chancellor-Mackay of running Ethereum Classic — a fork he supported in mid-2016 as a pump-and-dump scheme. Ethereum Classic coins are currently worth less than $12 each, against $300 for Ethereum itself. The SEC issued a cease-and-desist order against the way GBTC was operating back in 2016. It has apparently neither ceased not desisted. It persists. You may have trouble finding this information. One of the primary media for cryptocurrency news, Coindesk, is a subsidiary of DCG. These sorts of charges are bound to come up in a new market, for a new kind of currency that claims to be beholden to no government or regulator, as the internet claimed it was when the Web was spun in the 1990’s. But today’s internet is heavily regulated by governments around the world. You can go to jail for what you write here. Governments aren’t going to wait that long before pouncing on cryptocurrency. Some, like China, already have. Still, if you are a small investor, or investing for a retirement account, GBTC may be the best bet you have for profiting on the future of bitcoin. One of the most exciting Initial Coin Offerings (ICOs) of the year, which is like an Initial Public Offering only it’s not for an exchange-listed security and is taking crypto-coins rather than cash, is tZero. TZero bills itself as a general ledger system for capital markets, a true Alternative Trading System. Partners include the Argon Group — an ICO market maker — and RenGen, which will build the trading platform. Put your coins in, buy real securities with them; get your coins back; profit! Because it’s using a blockchain, tZero is supposed to cost less to operate than other security trading platforms. The ICO hopes to raise up to $500 million. Right now, tZero (or t0 if you prefer) is a subsidiary of Overstock.com, Inc. (NASDAQ:OSTK), the little e-commerce merchant that couldn’t overtake Amazon. Overstock has been selling merchandise online for around 20 years. CEO Patrick Byrne’s father was the legendary John J. Byrne, who built GEICO, now part of Berkshire Hathaway Inc. (NYSE:BRK.A, NYSE:BRK.B). Warren Buffett once called Byrne Sr. “the Babe Ruth of insurance.” Patrick Byrne is not yet even George Selkirk. But Overstock has been public since 2002, has a market cap of $750 million, and it was the first e-tailer to take bitcoin as payment, in 2014. Since Byrne announced tZero, the stock is up 25%. There will be two types of tokens at tZero. There are security tokens representing ownership of the company, then there are application tokens, used to buy and sell companies previously funded through ICOs. In short, this is an ICO to create a market for all those other ICOs, one which, by complying with SEC rules, and those of the Financial Industry Regulatory Authority (FINRA), hopes to create a more efficient market for all securities. Can it work? Over $2 billion has been raised through ICOs since January 2016, and those assets need a trading platform as efficient as those that trade the currencies themselves. The New York Stock Exchange started under a buttonwood tree trading just government bonds. What are the risks? Start with the cost of getting those SEC and FINRA approvals. Then there’s the fact that other firms can do the same thing, including those which, like Goldman Sachs Group Inc (NYSE:GS), which is considering trading bitcoin itself, have a lot of experience dealing with government regulations, not to mention lots of customers and big trading floors. OSTK is certainly on the ground floor here. There is a Wild West aspect to bitcoin, ICOs and blockchain that causes this to all make sense. As I have written many times, blockchain is what matters. bitcoin — all crypto-currencies — are merely implementations of blockchain, a general ledger database in which each block of data is encrypted. It allows decentralization of trust, which is essential to commerce. It is an outgrowth of open source, giving all developers access to a high, rising platform on which to build. Decentralizing trust — making agreements about money automatic and enforceable — threatens big banks and even governments, who gain their economic power by centralizing trust. Bitcoin advocates dismiss these concerns, saying open source faced the same arguments from proprietary developers like Microsoft in the last decade. Now, MSFT, the 40-year-old enterprise software company, is a big booster of open source and it may be the best and most low-risk bitcoin play of all. Microsoft is building Blockchain as a Service on its Azure cloud, the biggest rival to Amazon in hosting cloud applications. Since launching its first Ethereum Blockchain as a Service in November 2015, Microsoft has been moving as quickly as it can in the space. Azure has a blockchain development framework, it supports multiple blockchain protocols and it can now implement “smart contracts” on Azure that are legally binding. MSFT also has a framework for enterprise blockchain networks, dubbed Coco. I own Microsoft stock, and analogize all this to the California Gold Rush. A lot of people went into the hills to pan for gold, but the people who made the big money either outfitted the miners or, even better, handled the back-end bookkeeping. It’s not about the sizzle of bitcoin. It’s about the steak of blockchain, and what that can do to get business out of offices and into the cloud. There are other enterprise players interested in blockchain. International Business Machines Corp. (NYSE:IBM) has been putting enormous efforts into blockchain lately. You hear more IBM blockchain ads today than for Watson, its AI system. The difference is that while IBM focuses on defining and marketing technology, Microsoft has always focused on developing and then selling it. While IBM is still led by marketers who hire technologists, Microsoft is led by technologists who hire marketers. Microsoft CEO Satya Nadella is a cloud native. He ran Microsoft’s cloud division before he became CEO. His vision for the company, the one that he sold to its board, was as a cloud-first company, and he has executed on that plan. Blockchain, in the end, is a cloud application. Bitcoin is a derivative of the blockchain, just one of many. The conservative play in this market is to bet on the casino, not the gamblers. Previous Post Another Bitcoin Price Hike!